I've prepared an additional two sections again this month. This material is so interesting for me that the motivation to keep on translating is overwhelming! 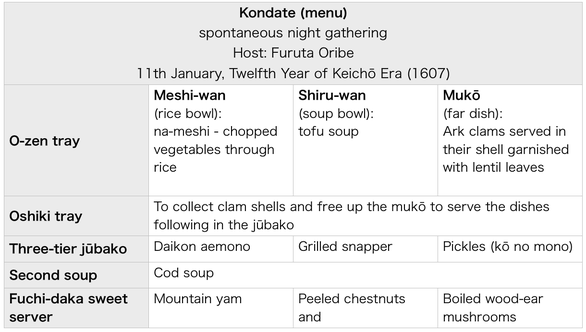 Sections 15 and 16 are especially interesting in that they paint a relatively vivid picture of one of Oribe's night gatherings, held spontaneously on the 11th January, Twelfth Year of Keichō Era (1607). In the tea record we see some groovy things going on. 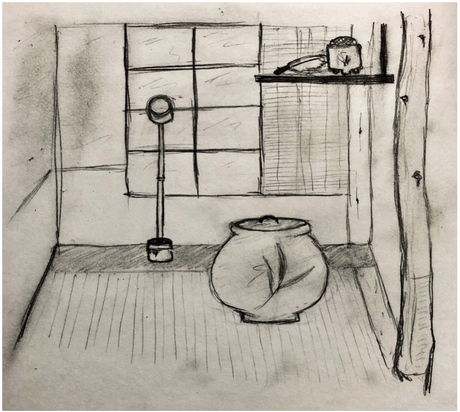 For the dōgu we see an initial display with the hishaku standing upright, the cup of the ladle resting against a crossbeam of the furosaki window. The bamboo futaoki is at the base of the hishaku on the threshold board at the far side of the temae mat. The kaiseki is pretty elaborate for a spontaneous gathering. Perhaps there were some good left-overs from New Year's celebrations. Examining Oribe's kaiseki is quite liberating for us who practice the set format of modern-day chanoyu. The sakazuki saké dishes used as lids for the soup bowls is a funky touch. If you'd like to get the full posts of this riveting insight into the chanoyu of Furuta Oribe and chanoyu history in general, please consider my Patreon.